In this post, we will tell you a bit about the place and what it took to get there, with a subsequent post on the places themselves. Bhutan… we had been eyeing this remote Himalayan Kingdom for over a year, and actually planning the trip for over 8 months… This is one remote place! We met in Bhutan with Mari’s uncles and cousins (Gilberto, Mirela, Victoria & Julia), and had a wonderful time!!! They really travelled a very long way to get there! We planned or trip for 7 days, and focused in the area of the west and the capital. This is really the minimum you should do. As mentioned above, a Bhuddist monarchy was established in Bhutan in 1907, with key representatives of all states electing the first king (Ugyen Wangchuk) and naming his lineage royal. To be fair, there had been a previous man in the family that had been a quite popular Lama. The fourth king (current one is the fifth) was the first to declare he would step down from the throne and pass it on to his son in life, and he also laid the groundwork to change the country into a constitutional monarchy, so now they also have a National Assembly of elected representatives. Depending on the region (and the type of work the people did – herders in the mountains vs workers in the cities) people can have more than one spouse… so for example, a single woman could be married to 3 herder brothers, as one would stay at home while another was in the mountain with the herd, and a third one in the city selling their wares. The brothers would alternate responsibilities and only one would be at home at a time. In the city, men can be married to more than one woman, up to 3 (but the previous king had 4… the benefits of monarchy!). Bhutan is a Bhuddist country since more than 1000 years ago… which led us to think its history was all about peace an understanding… the reality is quite different than this, as up to a couple of hundred years ago there were quite a few battles and wars, not only between countries, but also between different schools of bhuddism. This is not the case any more, but there are quite a few articles online that document many cases in the last century of discrimination against other religions (we did not feel discriminated against for a second ). In 1990, one fifth of the population was expelled from the country as they were a variant of Hinduism that was starting to become a vocal majority. All of this to us was quite surprising, expecting bhuddism in general to be all about peace and love. I guess even the most enlightened are affected by power struggles and other human afflictions. Bhutan is the country that is demonstrating the concept of Gross National Happines – mean to be a more holistic indicator of the quality of life than GDP. There are plenty of articles online about it if you are interested. Suffice to say we found people to seem fairly happy, with apparently low levels of homelessness and extreme poverty. We do not think that it seems like the happiest country in the world (we are looking at you Myanmar! )… It is definitely great to see a country that takes into account more than income as an indicator of happiness and wellness, and hopefully this will spread far and wide (the first step to fixing a problem is seeing it and measuring it!). Anyway… enough of information you can find in other places, on to how to get there! Planning a journey to Bhutan is not a very difficult job. This is because all travel there is regulated by the government, so everything has to be done through a registered travel agency. All of them have a set of standard routes, which are quite spectacular, but you can feel free to move it around as needed. We found the Bhutanese to be quite helpful and accommodating. In the past, there used to be visa quotas to get into the country, but that was changed a few years ago as the country wants to develop tourism more. They still control access quite highly, and manage the volume of tourists by making the trips relatively expensive. There is a set price of somewhere between 220 USD and 250 USD per day per person, depending on the time of year, and this includes everything except tips and additional drinks. You get a 3-4 star hotel, meals, a tour guide, driver entrance fees to wherever you go, permits, etc. All in all, it is an expensive proposition, but not as bad as it sounds once you factor everything in. The money needs to be payed up front, and is payed to the government, which apparently only releases it to the travel agency once the trip is completed… as you can see, quite controlled. Nevertheless, the country seems quite interested in bringing more people over, and have a favourable view of the coup try outside of it. The travel agencies advertise quite heavily all of the festivals (there is basically one per month, each in a different city) as a way to experience the Bhutanese culture. We went to a smaller one of these, and found it to be interesting, but not the highlight of the trip. The best part of it is without a doubt the amazing and breathtaking scenery. You really can not believe the views… as you travel across valleys (and probably get a bit dizzy with all of the winding roads), it is just one magnificent view after another. The country has a law where they can not have less than 60% of the national territory as forest (and my understanding is that currently it is close to 75-80%), so no matter where you go, all you see is spectacular mountains covered in green. From our limited experience, it seems like the locals are doing a good job about keeping their country in a green state (they say that they are the most carbon negative country in the world). There are quite a few cities and monasteries that can’t be missed, but Bhutan is also well know for the different treks that can be done, including the infamous snowman trek, a 27 day affair that is considered one of the worlds toughest. We stayed mostly in the cities and towns but did do a one day trek up to see the famous Tigers Nest monastery (this is probably the one thing in any trip to Bhutan that CAN NOT be missed). We will tell you more about all of those places in the next couple of posts. Wrapping up this very long post, we found Bhutan to be an incredible place, with amazing nature and scenery, and kind, helpful people. This is definitely a highlight of the Himalayan region, and we recommend to go there without reservation. 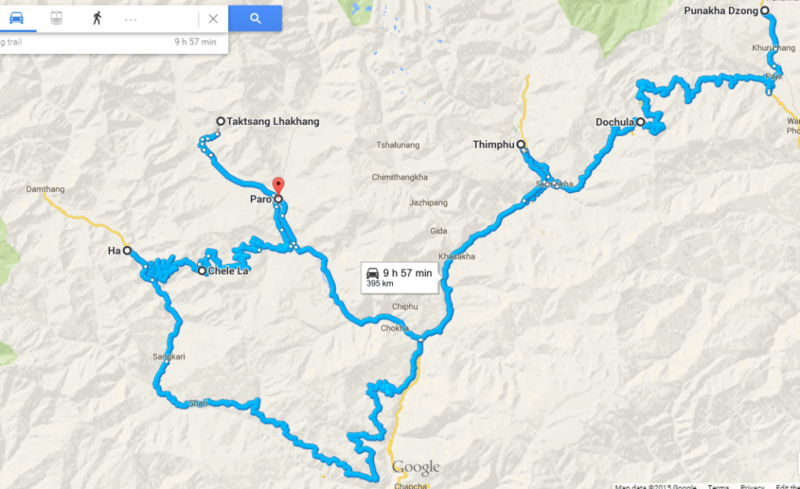 Here is a snapshot of our route, to read about Paro and Haa, click here. To read the final part, Thimpu and Punahka, click here.